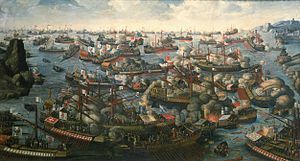 The Battle of Lepanto took place on October 7th, 1571. Occupied by the Turks in 1498, Lepanto is chiefly celebrated for the victory won by the combined papal, Spanish, Venetian, and Genoese fleets, under Don John of Austria. The Turks had 208 galleys and 66 small ships; the Christian fleet about the same number. The crusaders lost 17 ships and 7500 men; 15 Turkish ships were sunk and 177 taken, from 20,000 to 30,000 men disabled, and from 12,000 to 15,000 Christian rowers, slaves on the Turkish galleys, were delivered. Though this victory did not accomplish all that was hoped for, since the Turks appeared the very next year with a fleet of 250 ships before Modon and Cape Matapan, it was of great importance as being the first great defeat of the Muslim forces on the sea. Held by the Venetians from 1687 to 1689, and thence by the Turks until 1827, it became in the latter year part of the new Greek realm. Today Naupactus, chief town of the district in the province of Arcarnania and Ætolia, has 4,500 inhabitants, all Orthodox Greeks. The site today is rather small and silted up; the strait connects the Bay of Patras with the Gulf of Corinth. Miguel de Cervantes, a soldier for Habsburg Spain, was so severely wounded in the hand at Lepanto that he became a writer. The Holy League credited the victory to the Virgin Mary, whose intercession with God they had implored for victory through the use of the Rosary. Andrea Doria had kept a copy of the image of Our Lady of Guadalupe given to him by King Philip II of Spain in his ship’s state room. Pope Pius V instituted a new Catholic feast day of Our Lady of Victory to commemorate the battle, which is now celebrated by the Catholic Church as the feast of Our Lady of the Rosary. This entry was posted in Blog and tagged Cervantes, Europe, Islam, Rosary, slavery. Bookmark the permalink.